To say that for me, this Iron Chef dinner is my Olympics, is not understatement. I've trained for it, prepared for it and dreamt about it. I've made sure that I've taken plenty of vitamins to ensure that I don't get an unexpected cold, carefully chosen my outfit and counted down the days, hours and minutes until this amazing event. Arriving at 6pm we come across our fellow diners, all 120 of them. Its a large crowd and apparently double the size of last years. For them to host a total of 360 diners over the 3 nights must show that despite how long ago production ceased, the Iron Chefs still have a strong allure. People are mostly dressed up (although there I see a diner in t shirt and jeans) and range from wealthy looking older couples, corporate looking thirtysomethings to the book wielding fans, some who have traveled quite a distance and at considerable expense to be there but who confess that their income doesn't usually stretch to the heights of $500 a plate. There's a little competition between these book clutching Iron Chef fans with guarded questions like "So how many times have you seen them cook? Me I've seen them three times". 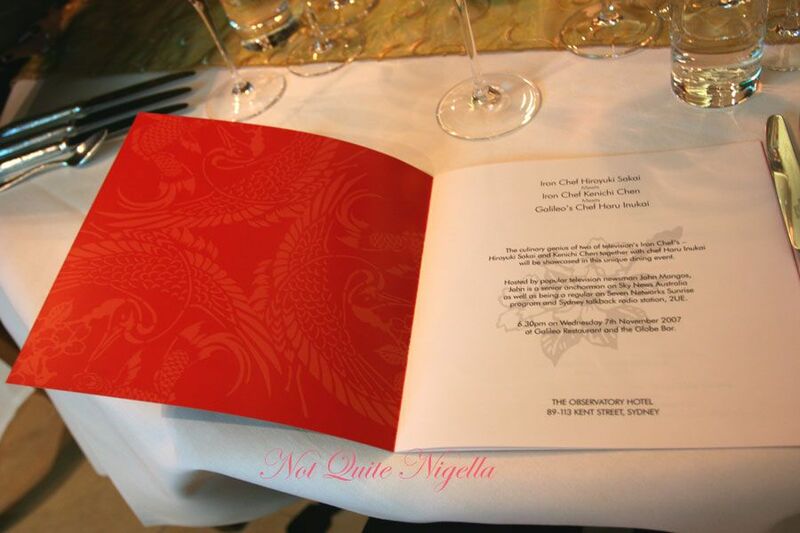 There's also a real excitement in the air, the staff are buzzing around excitedly and ensure that people are greeted and taken care of and diners know that they're in for a special event. Iron Chef Chen walks through the lobby and several people stop him and ask for a picture. He gladly obliges and is friendly and approachable. When the grandfather clock strikes 6.30pm we are ushered into the Globe Bar. They've set up tables in both the Globe Bar and the Galileo restaurant to accommodate everyone. We are sitting with the other winner of the Australian Macadamias competition and her partner. Perusing the menu it comprises of a welcome cocktail, a six piece entree plate with 2 dishes from each Iron Chef and 2 dishes from the Observatory's Chef Haru, 5 mains and 1 dessert, all with matching wines. Ingredients such as lobster, foie gras, zucchini flower, sea urchin and the famed Kinugasa mushroom feature and the excitement level goes up a notch at seeing the mouthwatering sounding dishes. 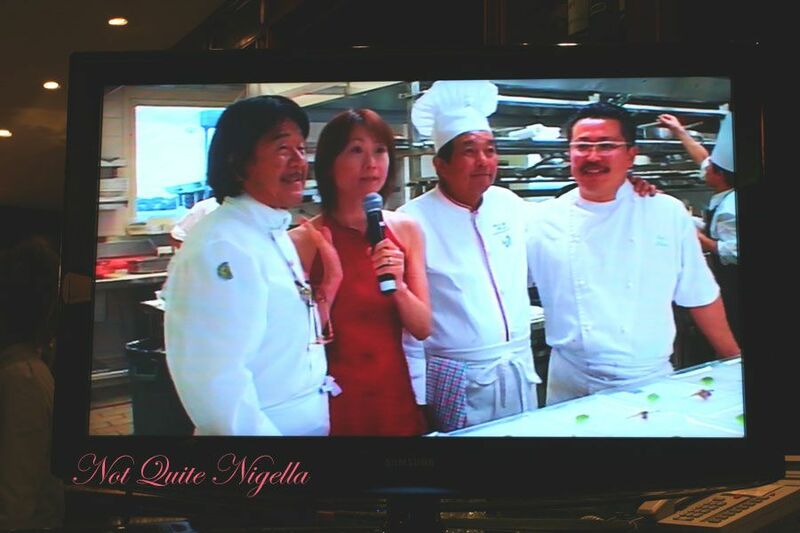 There's a flurry of chef's whites and suddenly Chen is jovially wandering around the room welcoming everyone to the evening and he stops and takes photos with us. 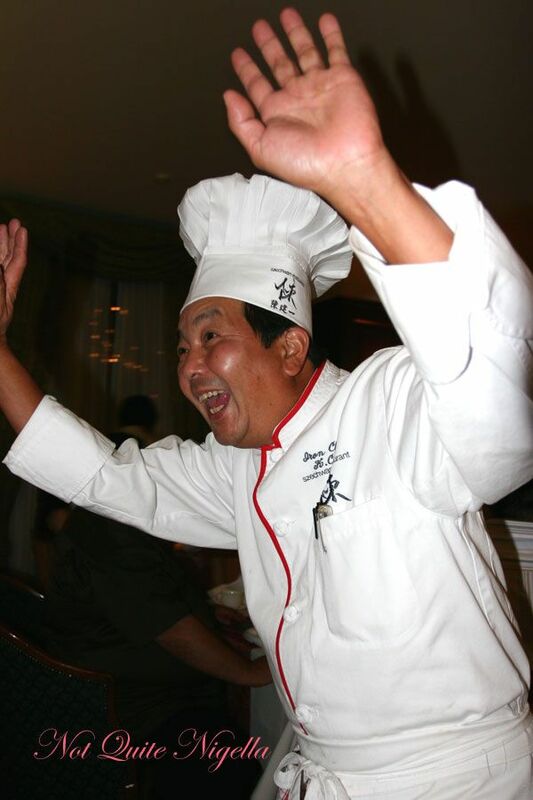 We _touched _an Iron Chef we whisper!! Soon after we are enjoying the welcome cocktail: Champagne Chambord made with NV Pol Roger "white Foil'", Epernay, Champagne. 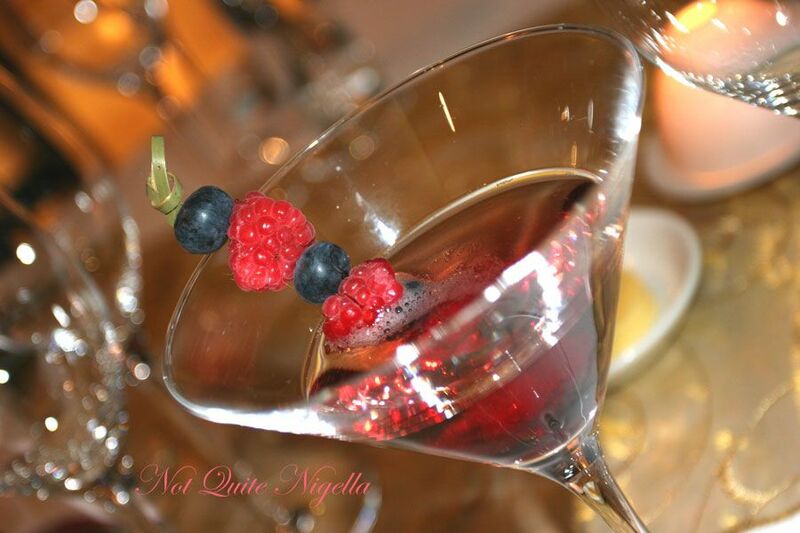 It deliciously sweet featuring a toothpick of firm, sweet lush blueberries and raspberries. Our entree plate arrives minutes later, as we're one of the first tables, we get served first and we are delighted at that. French Iron Chef Sakai's contribution are Mousse de Saumon and Soupe a l'Ail avec Gelee de Gazpacho. 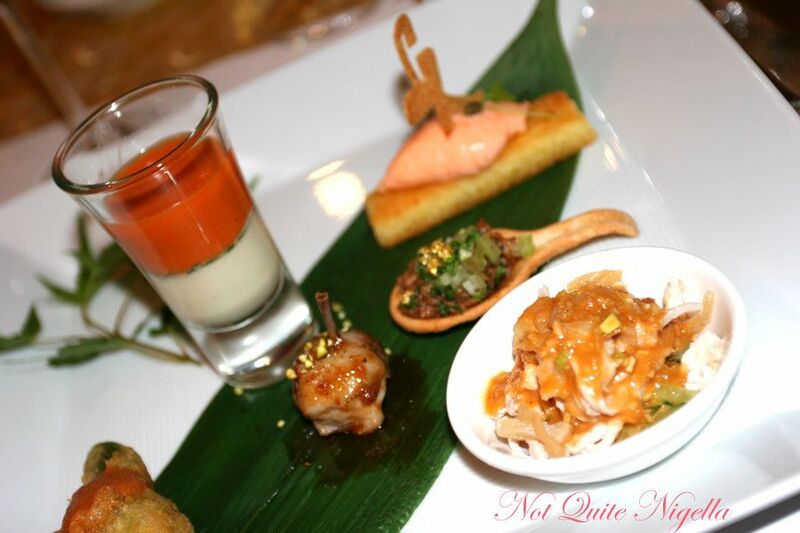 Chinese Iron Chef Chen's dishes are Sesame Infused Cold Steamed Chicken and Braised Carp with Chilli sauce and Observatory Chef Haru's dishes are Zucchini Flower with Calamari and Quail Confit. 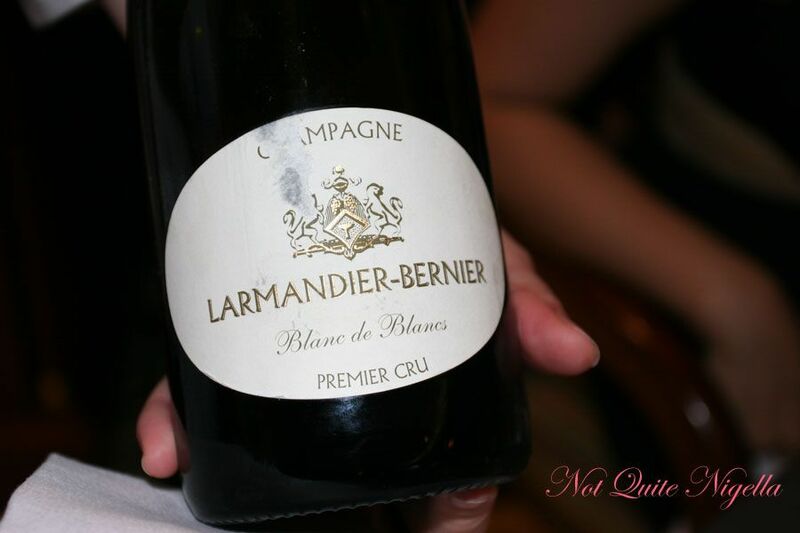 The matching wine is NV Larmandier-Bernier Blanc de Blancs Brut, 1er Cru, Vertus, Champagne. I try them in order of cuisine: Sakai's Gazpacho soup scarlet top layer is sweet and tangy, redolent of capsicum and tomato, under this is a thin layer of very thinly sliced capsicum and then a creamy layer. His Salmon Mousse is stunningly rich and creamy and wonderful against the crispy buttery toast. Crispy and creamy are two of my favourite textures together and this is perfectly done. Chen's Braised Carp is served in an adorable pastry spoon, its rich, very complex and very, very moreish, I try and take tiny bites of this small flavour packed spoon so as to prolong the eating experience. There's some shimmery gold leaf on top and each bite is finished off with a delightful kick of chili which is not too hot but lets you know that its there. Cold sesame chicken is a favourite dish of mine and his is rich in chinese sesame sauce, a definite cut above others that I've had. There's a layer of the thinnest sliced cucumber and a small amount of the unmistakably textured jellyfish at the bottom. Its a taste that has you wanting more. Haru's Deep fried Zucchini flower with Calamari is lightly battered and tastes wonderful, the calamari pieces a lovely contrast to the soft zucchini flower. His Quail confit is served with a tiny bone sticking skyward which we at first think is a skewer. The tiny morsel is much appreciated by the whole table, its softness and flavour slightly different from chicken, like the dark meat but a touch gamier. 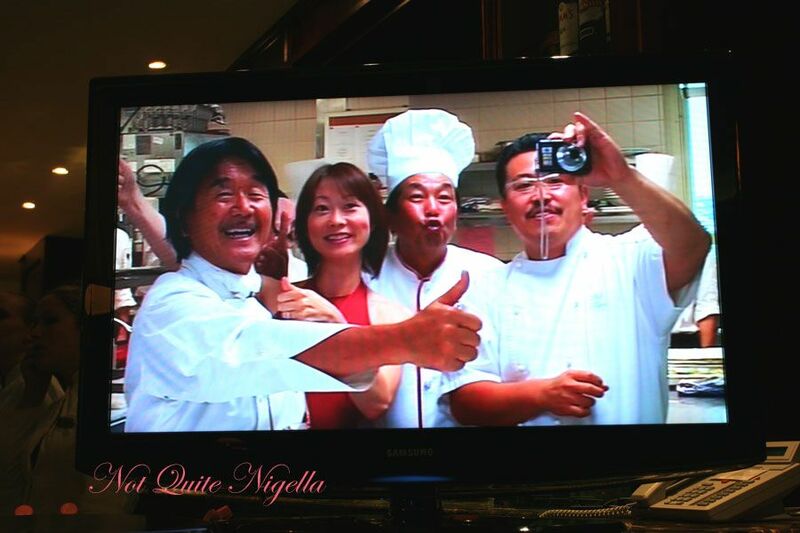 While we're eating we stop as the numerous plasma screens around the rooms flash and we see footage in the kitchen where the three chefs and the host Tomo are taking pictures of themselves on the screen. They're having a great time back there and take several photos together. 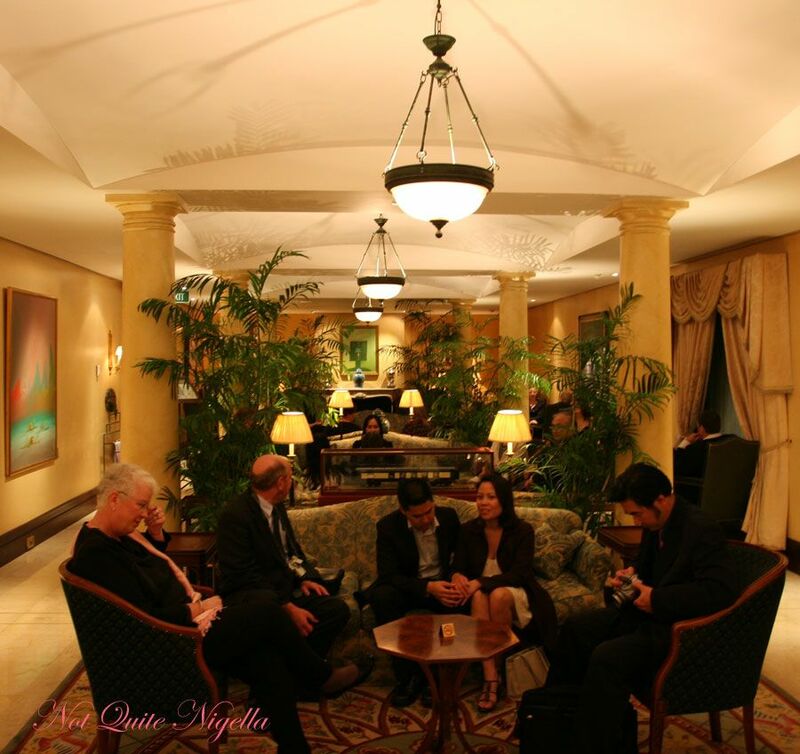 We're excited because they're clearly delighting at being there and the whole experience. Suddenly the Iron Chef theme music fills the room. John Mangos is welcoming everyone to this special night but he's having a lot of trouble with his microphone. We cross to the Kitchen where the three chefs and Tomo are greeting everyone. 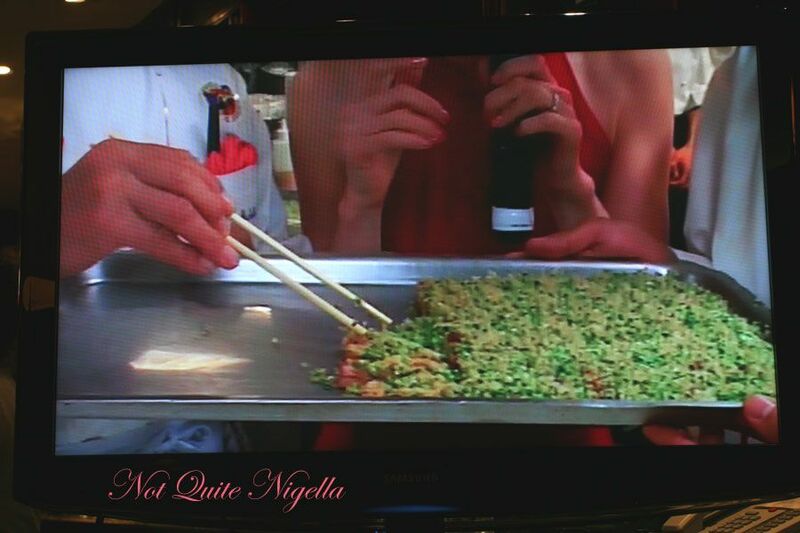 She introduces Iron Chef Chen and he's the most gregarious of the lot, saying "G'day Mate!!" over and over and mugging for the camera and generally playing up like a naughty schooboy. Iron Chef Sakai is friendly and happy and greets everyone in Japanese and Observatory Chef Haru is a shy, giggler who seems a little overwhelmed at the attention at times. 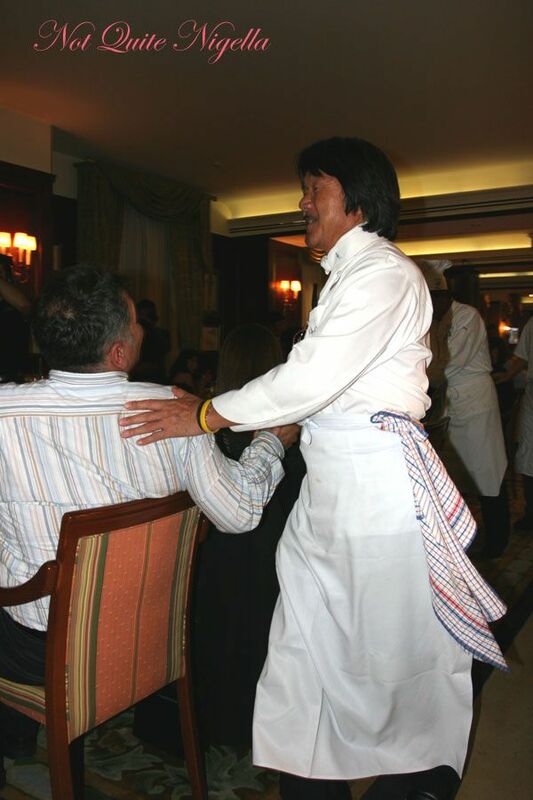 Chefs Chen and Sakai are clearly great friends and they talk about their friendship forged over 15 years on the show, arms across shoulder best buddy style. 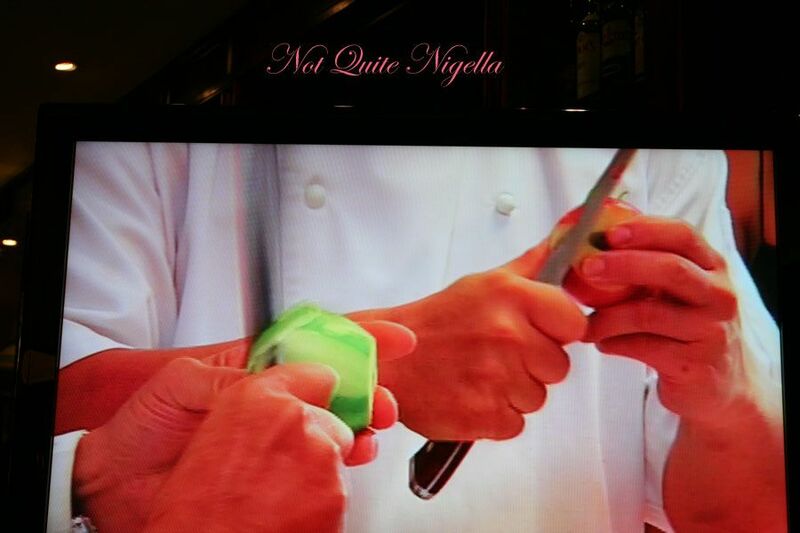 They explain that each chef is going to introduce and demonstrate preparing their dishes before we taste them. 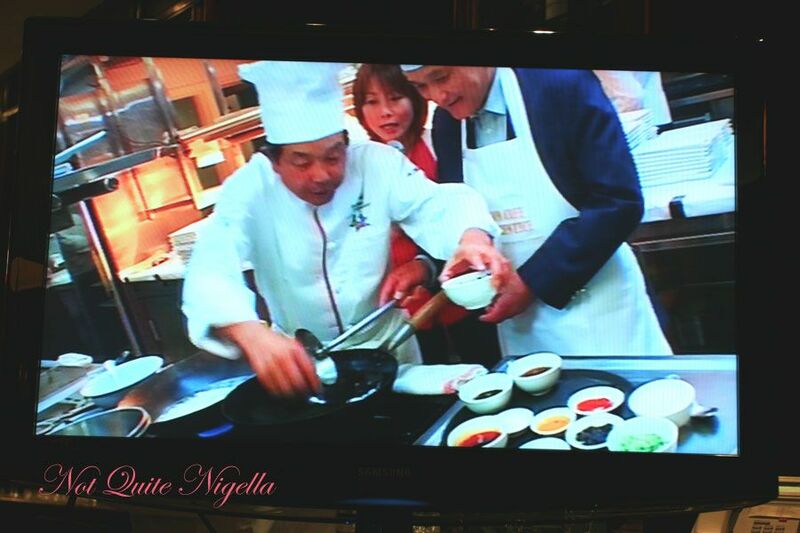 Sakai shows us a large tray filled with the smoked tuna from his first dish: Crepe D'Oursin et Fume de Thon, Sabayon au Curry. The matching wine is a 2005 Robert Weil Riseling Kabinett "Trocken" Rheingau Germany. It arrives from the kitchen minutes later and is a delicious sight to behold. A large fat spear of asparagus sits diagonally across the plate next to a paintbrush stripe of curry sabayon which beckons us to dip it. The mild curry sabayon is lovely with the asparagus, taking away some of its sharp flavour and rounding it off resolutely. A petite rectangle of smoked tuna rests on a green sauce and this is refreshing and deliciously good, the firm tuna texture and the finely sliced cucumber on top a lovely textural balance. The sea urchin crepe is a small parcel of buttery, eggy crepe filled with creamy mushrooms and sea urchin. Its my favourite of the plate with its creamy, eggy flavour and whilst the sea urchin flavour is subtle against the mushroom flavour, its soft, voluptuous texture is most definitely present. I find myself wishing that I would be presented with a never-ending one of these. Well a girl can dream can't she and on an enchanted night like tonight, you think it could possibly come true. We next find ourselves facing a very genki Iron Chef Chen who clearly loves the camera. He's repeating "G'day Mate" again and pulling funny faces and winning over the diners most certainly with his charm and personality. 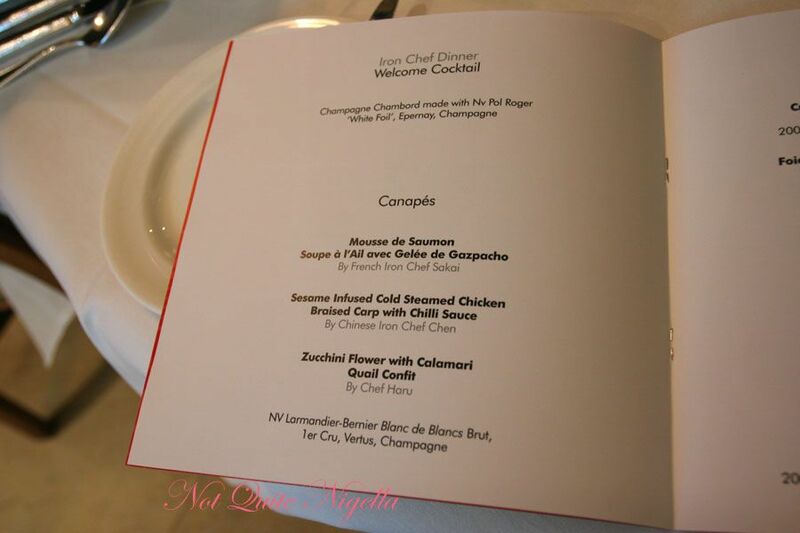 His dish is the Foie Gras Flan (custard not pastry flan), Mud crab soup (although it says king crab on the menu) and Kinugasa mushrooms. 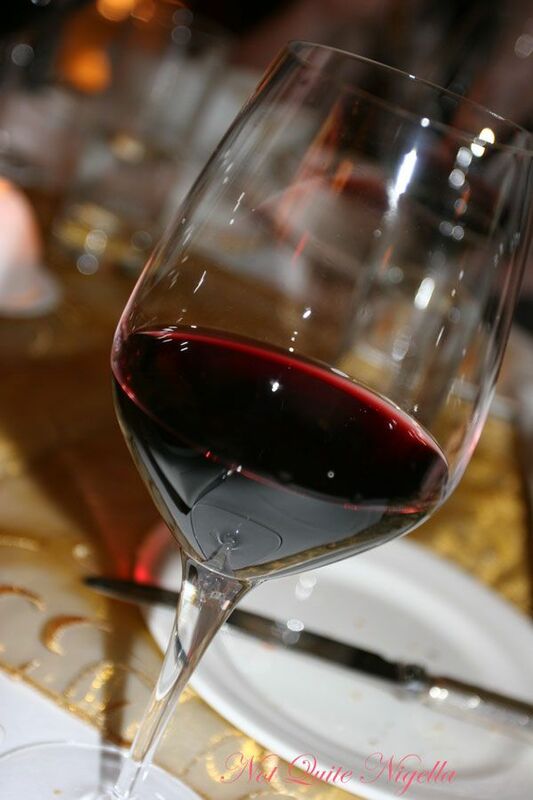 The matching wine is 2004 Vinoptima Gewertztraminer, Gisborne, New Zealand. He shows us the Kinugasa mushrooms which he jokingly says that he smuggled through in his golf bag and explains that while foie gras isn't a usual ingredient in Chinese cuisine, his friend Sakai suggested that he use it and that we should enjoy it separately before mixing it together. Its a marriage of Chen and Sakai he says proudly. It arrives in a fine bone china coffee cup along with Chef Chen who delivers this to a few tables of diners and the aroma is divine. 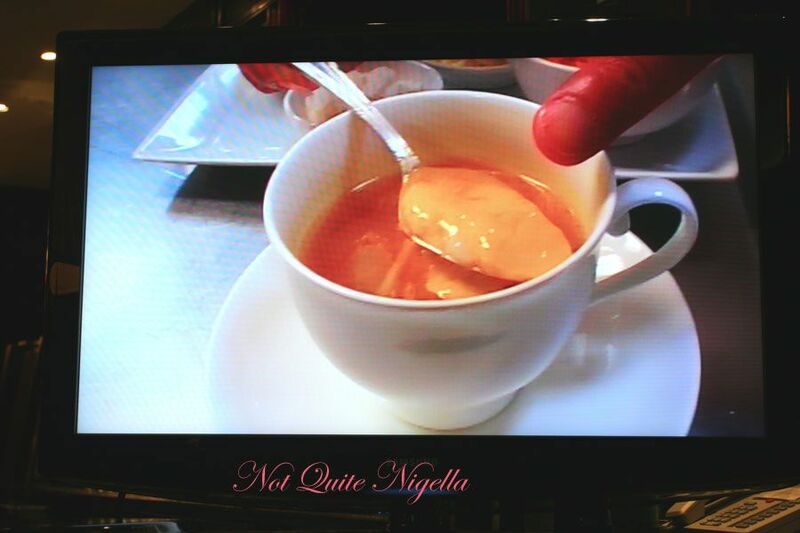 With the teaspoon given we dig in and there's a marked silence while each of us fully enjoys the flavour sensation. I feel myself babbling nonsensical phrases much like the Iron Chef judges like "The flavour is so complexly pleasing to my palate, I feel like I have enjoyed a profound moment". I have a good nose and for the life of me, I cannot tell what is in it, all my tastebuds are telling me that you are indeed eating something straight from heaven that is unlike anything you've eaten before and you'd better find out where you can get some before before you have taste bud revolt on your tongue. 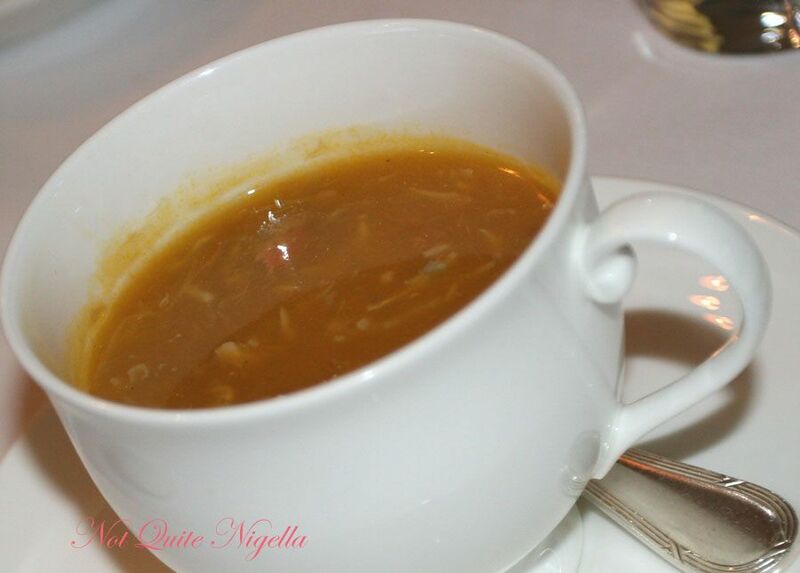 All I can tell you is that the soup was complex with flavours and very rich in mud crab roe flavoured stock. Slivers of the foie gras flan sit at the bottom and its a similar texture to the Japanese savoury custard dish chawanmushi with a lovely mild foie gras flavour. The famed and expensive Kinugasa mushrooms are an unusual texture, unlike any mushroom I've tried before. Its puffy and textured all over with small holes but translucent and almost jellyfish like in texture but much, much softer. My husband sadly doesn't get any in his cup, I get two pieces and others get one so maybe I got "his" piece (sorry honey!). 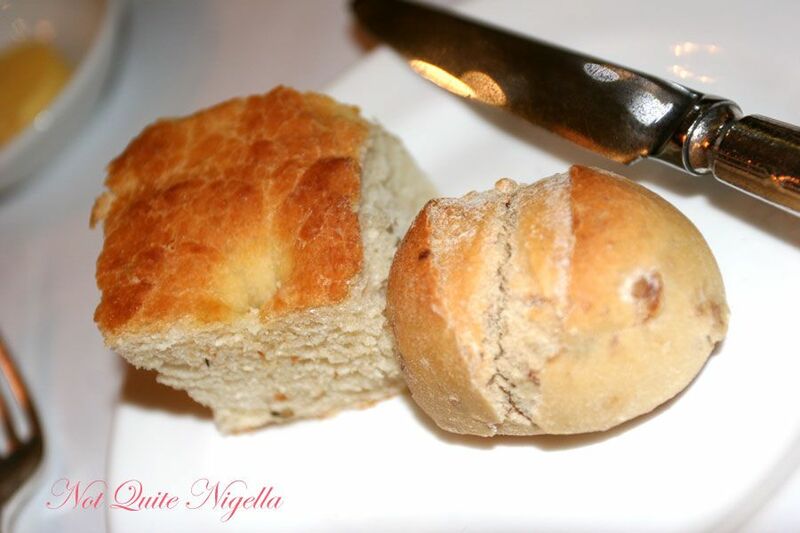 We are so eager to extend every morsel we dip the bread into our cups. The NZ wine is the firm favourite of the night, smooth, clean and crisp. John Mangos calls our attention and he's giving away a dinner for two at the Observatory and asks "Is anyone here having a birthday, anniversary or special occassion?" My Id is fighting with my Superego and I desperately want to make up something but I don't and of course another more deserving diner gets the prize. 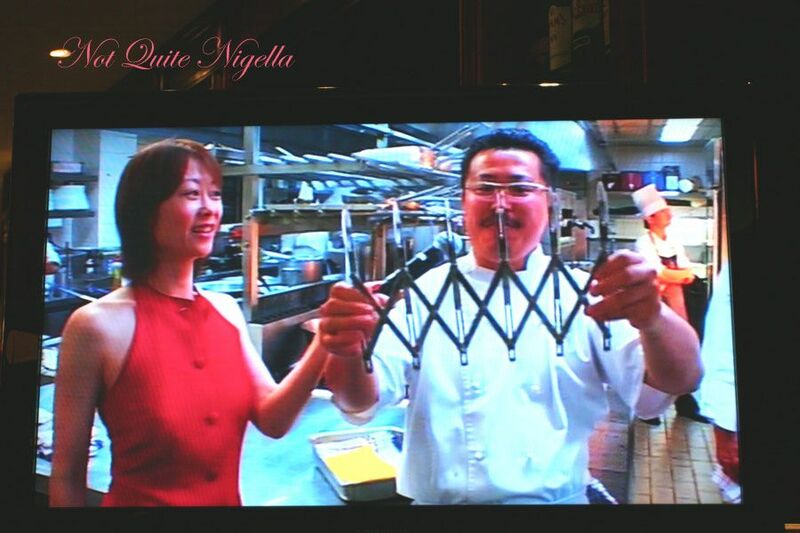 We flick to the screen with Tomo is standing with Chef Haru who is proudly holding a metal instrument that looks like a torture device for cooks that have been bad. Its accordion like and looks as if it has pizza cutters at the end. 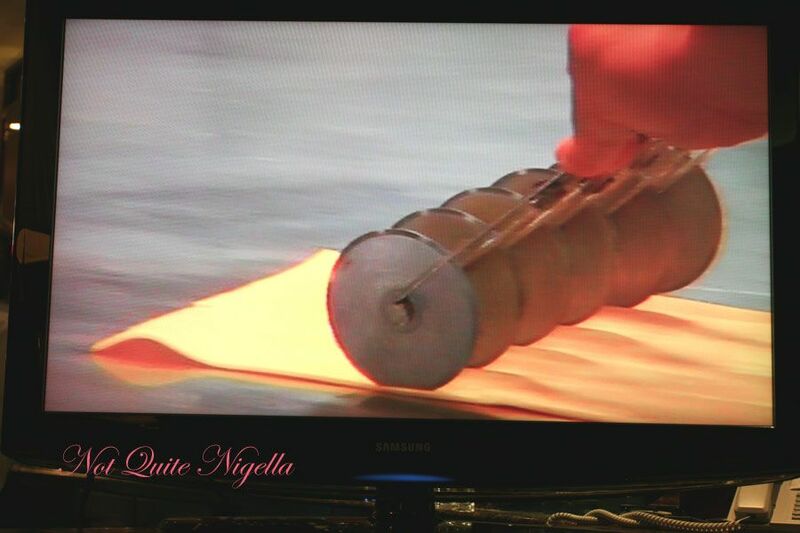 He explains that its to cut the fresh saffron pasta sheets into ribbons. 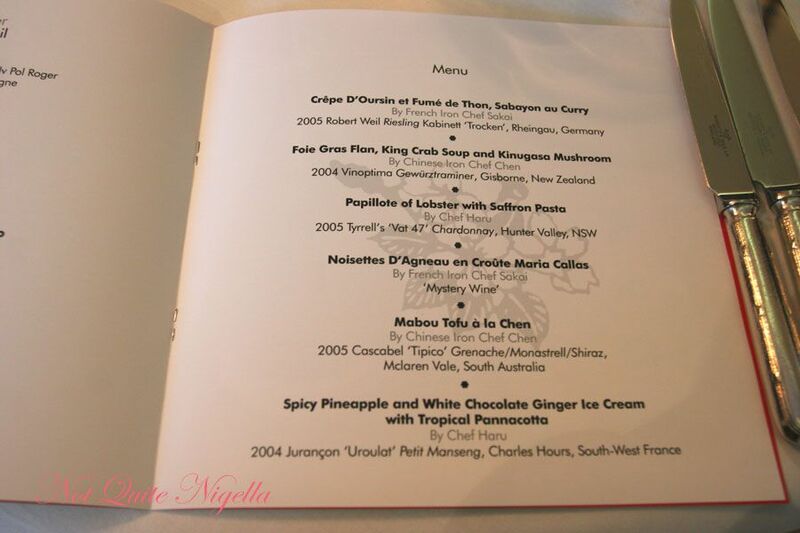 His dish is Papillote of Lobster with Saffron pasta and the matching wine is 2005 Tyrells 'Vat 47' Chardonnay, Hunter Valley NSW. It arrives in a square foil pouch which is hot to the touch. Slicing it open with knife and fork reveals a portion of lobster tail sitting atop wide ribbons of saffron pasta in a lobster saffron broth and some red capsicum slivers. 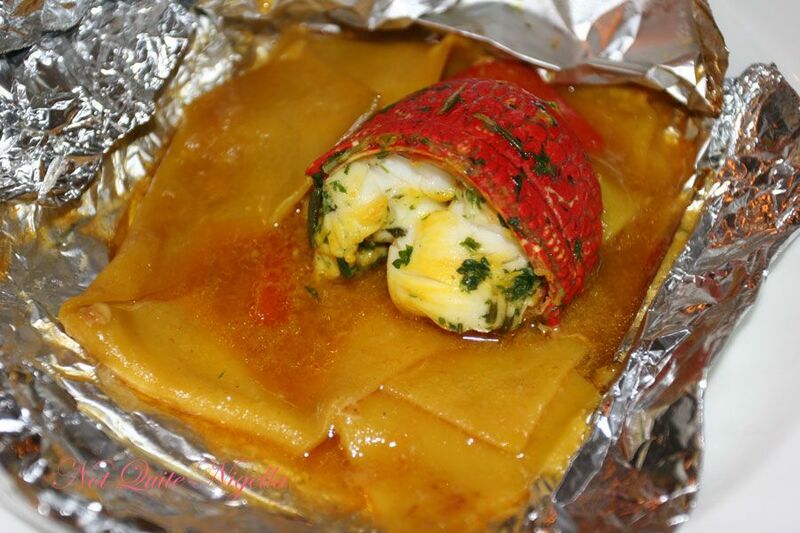 The lobster tail is firm, if I can say a little too firm for the pasta noodles which are soft, silky and slippery. They're similar in texture to the yellow won ton egg wrappers, comforting and soothing to the tongue. The matching wine we're warned has a strong acid aftertaste and they're not wrong. After a sip, it remains untouched by all. The waiter delivers us a glass of the first and only red wine of the night and asks us not to taste it yet as its a "Mystery wine" and part of a competition to see which diner gets to be an Iron Chef Apprentice. They call our attention and ask us to sip it. Now I'm not a fan of red wine at all but this seems a particularly bad one, its watery and weak but very strong with tannins. He asks us "If you think its an Old world wine please put your hand up, if you think its a modern wine please leave your hands down". In my flawed logic I think "No-one in the modern world could possibly want to make this rubbish with the technology and knowledge available" so I vote Old World and am counted out instantly as its modern. He whittles down the crowd through various questions about the wine until there are 4 still standing. He asks them which area of 4 in Victoria they think it has come from and each diner takes an area. The winner is chosen and she gets to cook with Sakai. 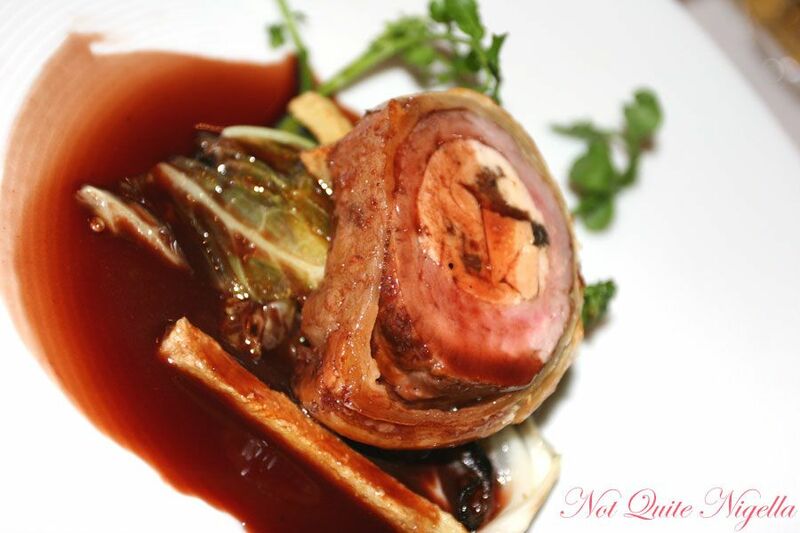 His next dish is the Noisettes D'Agneau an Croute Maria Callas, reportedly one of Maria Callas's favourite dishes. Sakai shows the lamb fillet being butterflied and pounded thinly, then filled with a foie gras, chicken and mushroom sausage and then wrapped in omentum (like tripe but thinner and lacier) rolled up in string to firm up. This is then wrapped in puff pastry, cooked to a buttery perfection and then sliced into rounds. 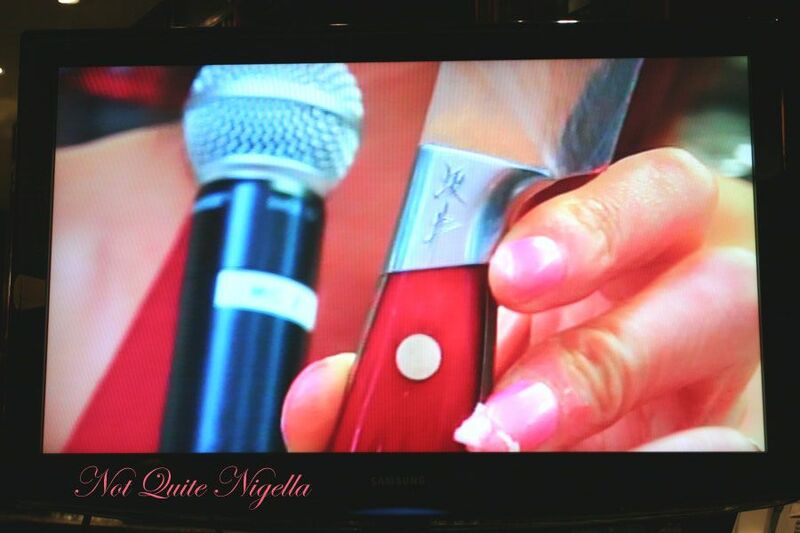 Sakai takes the opportunity to show off his own personal knife which he had custom made for his hands at a cost of $2,000. It even has his signature on the sheath and his name on the knife handle. He challenges Chef Haru to an apple peeling competition which Haru at first declines but reluctantly accepts and after a little knife sharpening action, as expected Sakai's custom bladed knife wins. 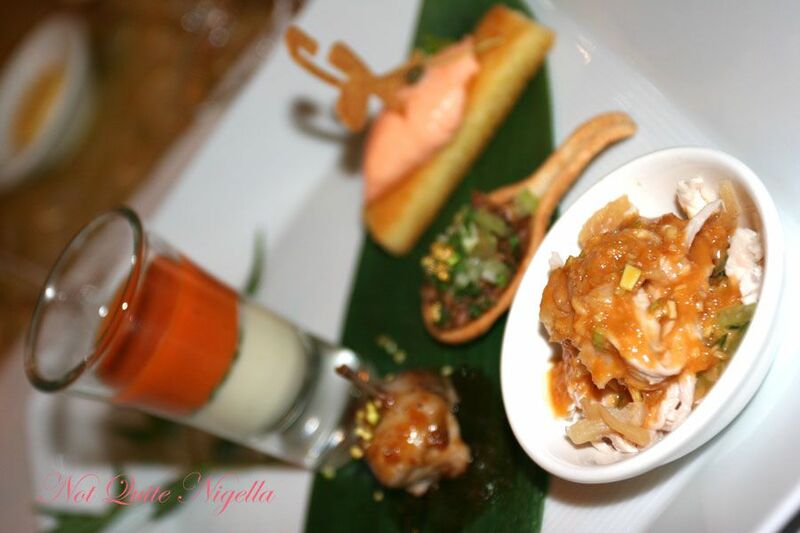 Our Noissette of Lamb arrives and as all Sakai's dishes, it looks picture perfect. The noisette sits on a bed of savoy cabbage and mushrooms with 3 thin potato french fries arranged around it. 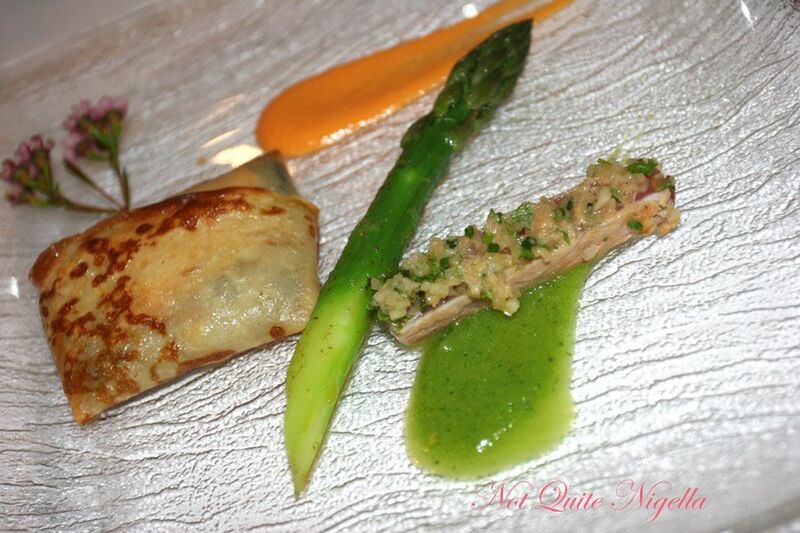 The sauce is rich and delectable and the lamb is tender and a nice contrast to the foie gras rich sausage it surrounds. 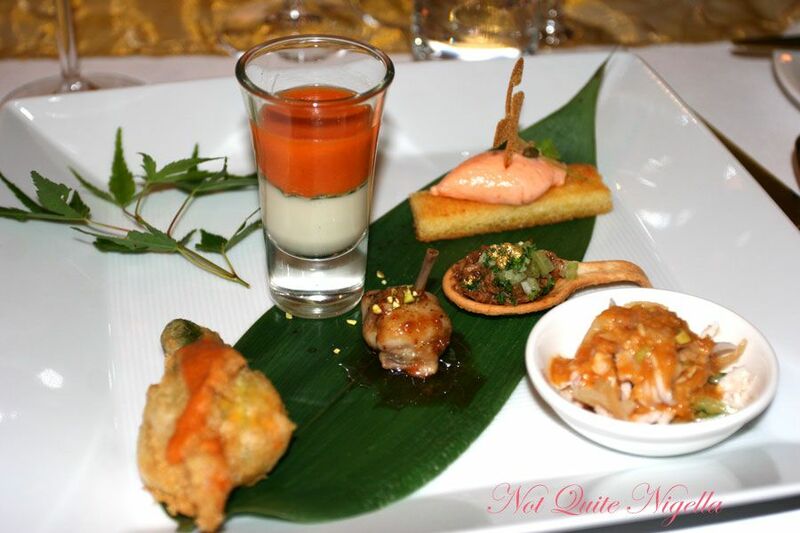 The whole dish is an exercise is richness with the three strong flavours. We see that we're not the only ones not particularly taken with the wine. It remains mostly untouched by our surrounding diners. There's another bid for an Iron Chef Apprentice and this time John Mangos asks if there's anyone born in Hong Kong. Two people put their hands up, an man who moved here 50 years ago and a woman who moved here 20 years ago. John gives the woman a dining certificate and the man is chosen as Iron Chef Chen's apprentice. He chats in chinese to Chen and they are enjoying a quick natter before they are interrupted so that Chen can create his very famous signature fish "Mabou Tofu a la Chen". 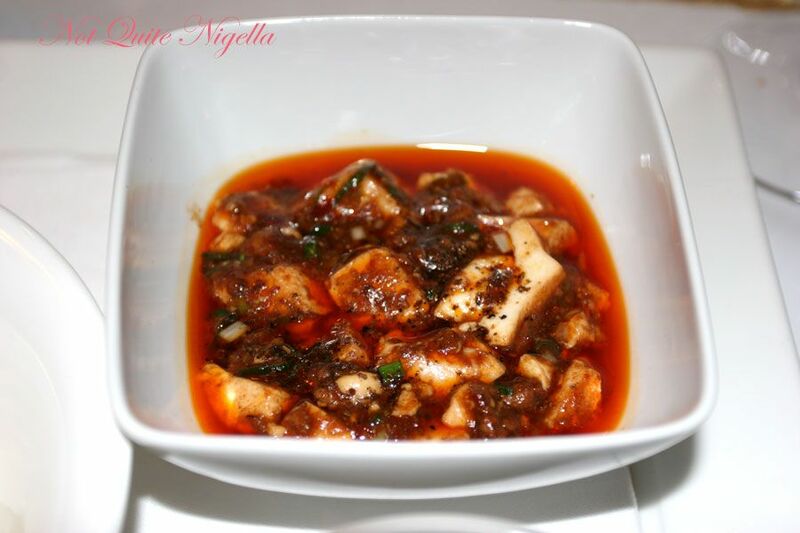 I adore this dish, its fiery and rich with silky soft tofu and since Chen is known for this recipe, passed on from his famous Szechuan chef father, we know that its going to be good. The matching wine is 2005 Cascabel "Tipico" Grenache/Monastrell/Shiraz from McLaren Vale South Australia. Its not bad but I'm still nursing the NZ white which is my clear favourite. If you've ever wondered like I have, how they keep the tofu so silky soft whilst retaining its square cube shape, Chen shows us that we need to cook it in boiling water for 5 minutes first. There's a flurry of spices and flavours including chili oil, bean paste and other things that Chen says with a wink that he has brought over in his golf bag. 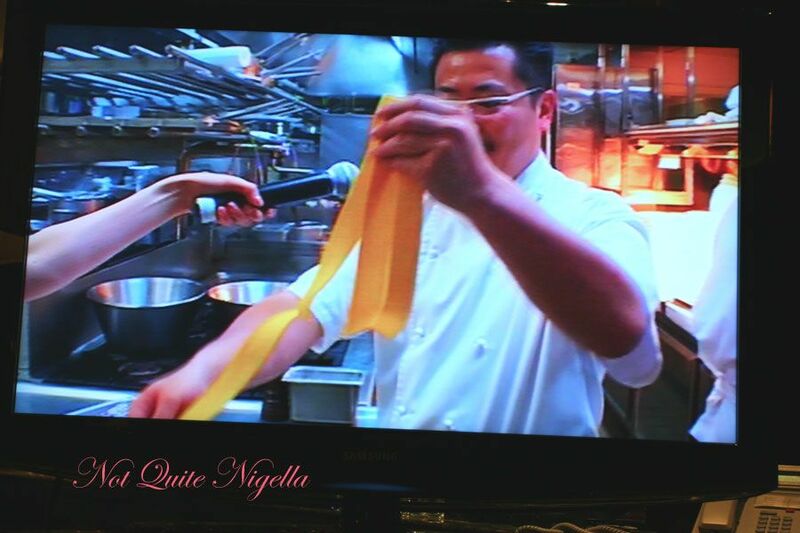 Indeed John asks him why there are so many ingredients for this dish and he explains "for complex flavours". 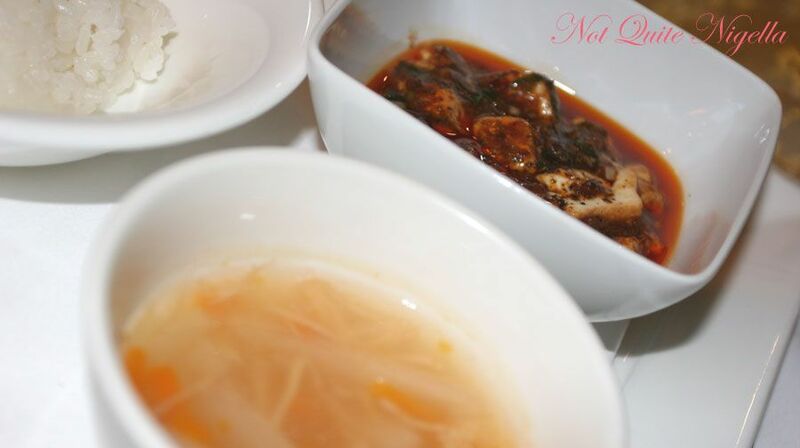 A square plate is brought out with a bowl of rice, a bowl of the famous Mabou tofu and a rich thick soup. It smells incredible. We tip the bowl of Mabou tofu onto the rice and dig in. Oh. My. God. This is incredible. Such complex flavours with a bite of chili, finely minced pork and pillowy soft tofu. We are in raptures and this is now moved to top 3 dish of the night status. If ever a legend was well deserved, its this dish. 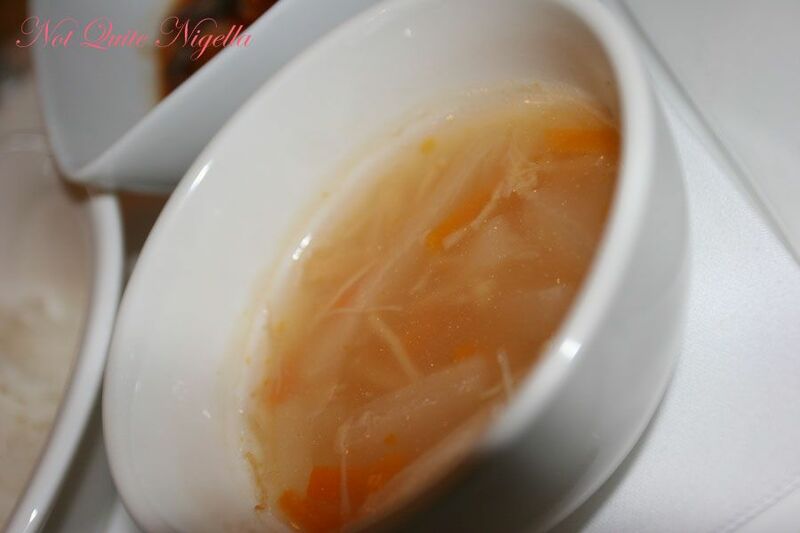 The soup is thick and gelatinous and has fine threads of noodles, carrots and chinese radish and is a soothing contrast to the spicy szechuan tofu. Despite the fact that we are very full, every bit of sauce coated rice is pursued on this dish leaving behind a scarlet streaked bowl. 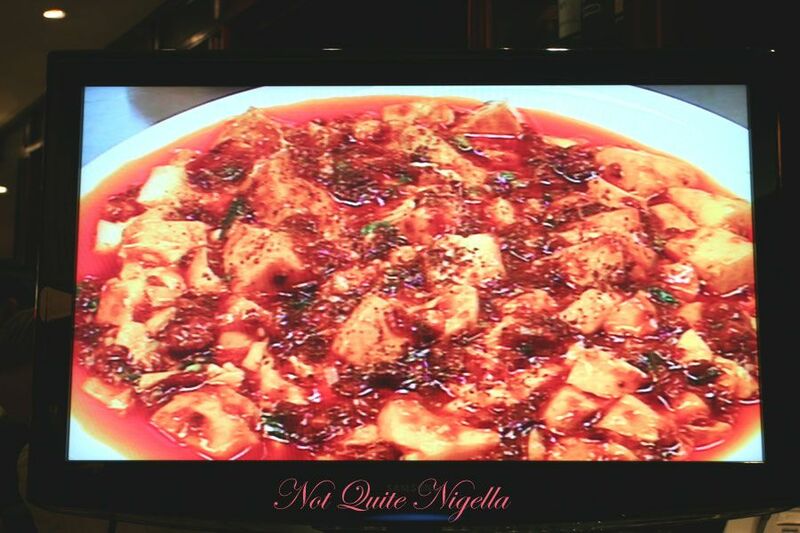 I've learnt one thing, that watching the show, I clearly underestimated Chen's dishes. They're not as fancily presented as Sakai's so a lot is often lost in the translation from TV to stomach. 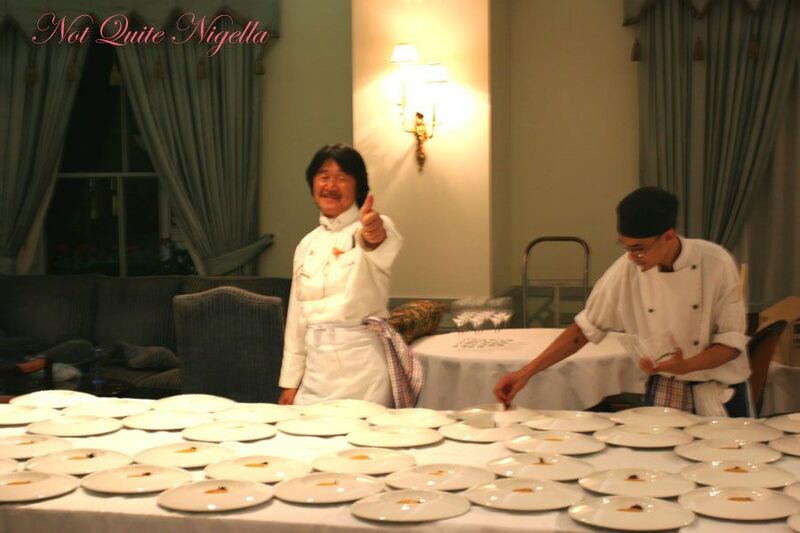 But his dishes have such a complexity of flavours and the care and knowledge is so clearly evident upon tasting them. So few dishes can lull a table into silence from the first bite. Indeed, my favourite dish of the night was his Foie Gras flan with crab soup and Kinugasa mushroom followed by the Mabou tofu. 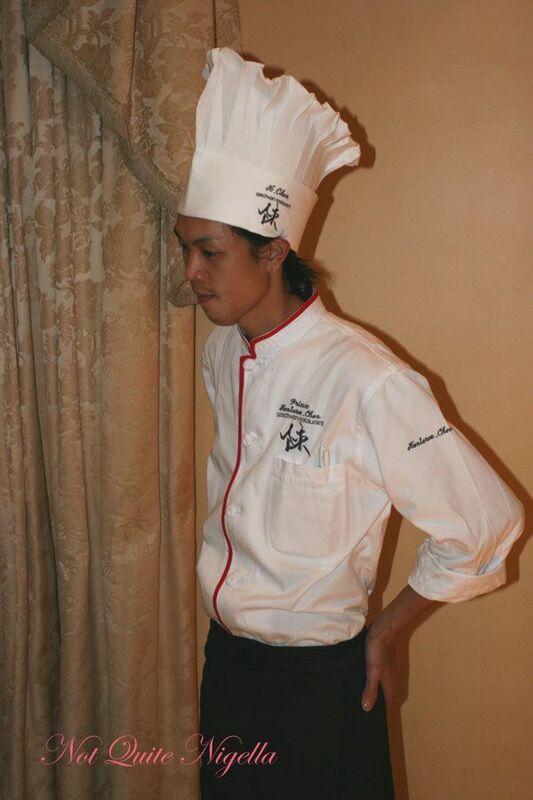 I am a firm Iron Chef Chen fan. A quick bathroom break with my fellow competition winner and on our way back to the table, we see Chef Chen exiting the restaurant again, he clearly loves being with the diners and if he was a royal, he would undoubtedly be called the "People's Prince". We cry out "Chen!" and he opens his arms wide for a hug which we gladly accept. We tell him how divine his dishes were, I should've probably broken out my rusty Japanese but when you have a live Iron Chef in front of you you just start babbling praise in whatever tongue you can muster! Our next and last dish is the dessert by Chef Haru: Spicy Pineapple and White Chocolate Ginger Ice Cream with Tropical Pannacotta. We've had some gorgeously presented desserts in our lifetime but this would have to be the amongst the best we've seen. There are gasps and a frisson of interest late in the evening when these arrive. 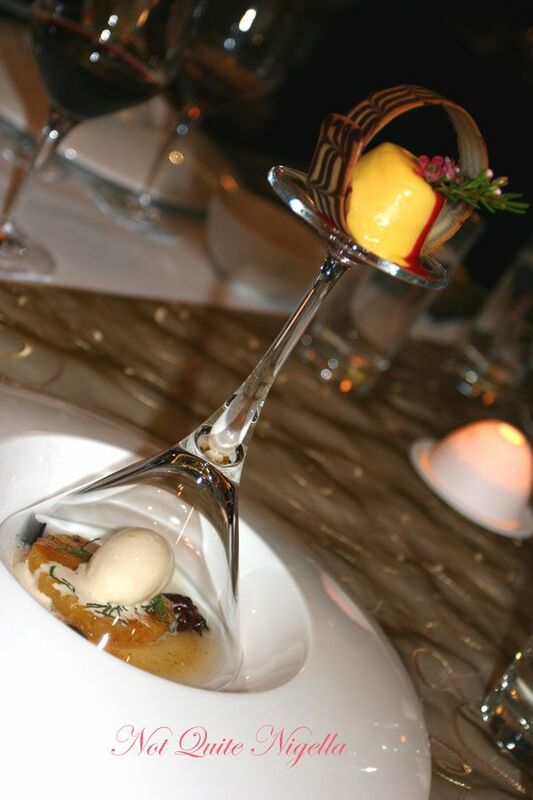 On a UFO like bowl sits a slice of the spicy pineapple, a quenelle of ice cream and inverted above that is a martini glass where on the base sits a tropical pannacotta edged by a circle of biscuit. The dessert wine is a 2004 Jurancon "Uroulat" Petit Manseng, Charles Hours, South West France. 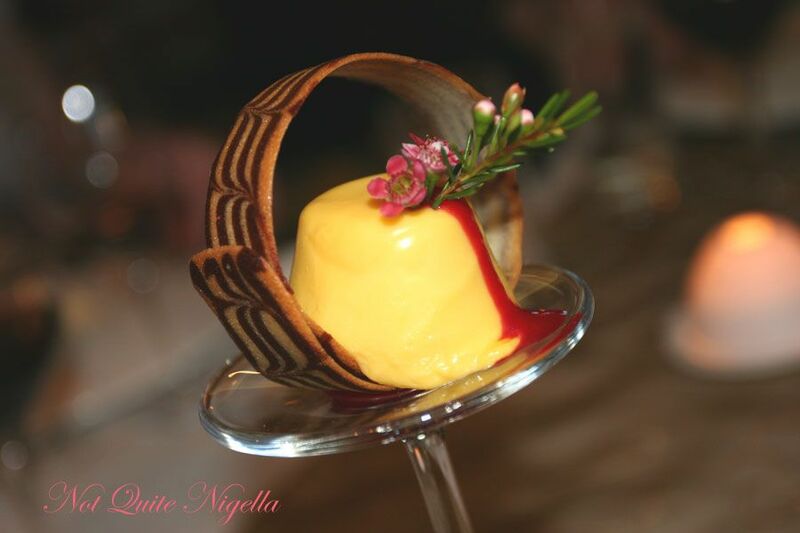 We dig into the petite pannacotta and is its texture is incredible-the smooth and creamy pudding is rich in fresh mango. I take tiny spoonfuls of this to extend the eating experience. The circle of biscuit is deliciously crisp with a chocolate and vanilla flavour. 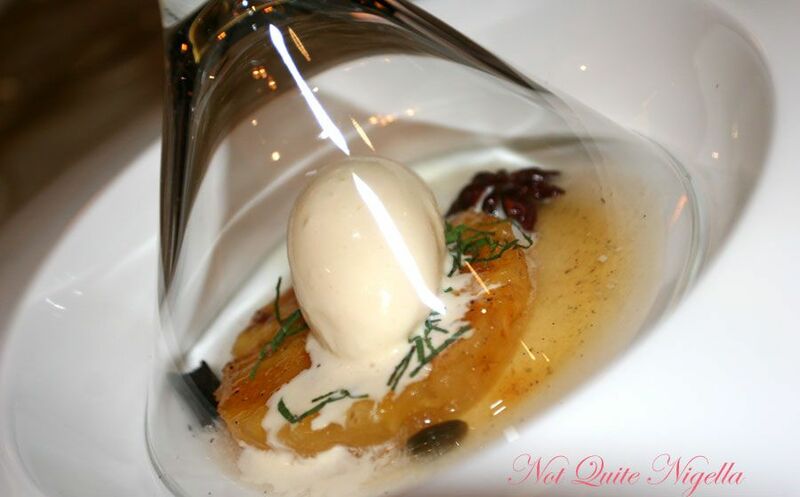 Lifting the martini glass, we taste the spicy pineapple which is flavoured with star anise, mint and cinnamon stick. Its sweet, juicy and perfectly spiced. I could eat this all day and its even better when combined with the richly gingered ice cream. Although I'm well past my full level, I can't help but scoop up every last spoonful of this breathtaking dessert. Its definitely top 3 dish material. The grandfather clock strikes 11pm and we realise that we've enjoyed an incredible 4.5 hours of dining bliss. 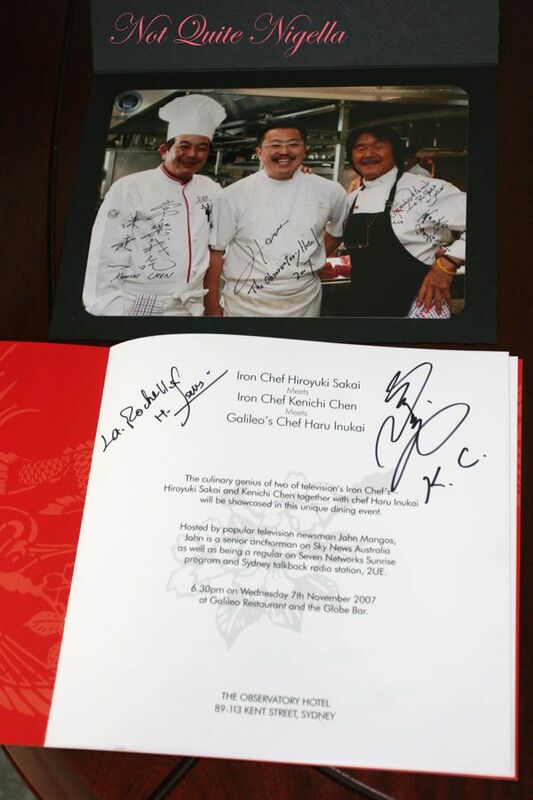 John asks Chen and Sakai and their team of Japanese chefs to do a walk around of the restaurant and they introduce us to the various people who have all played a part in this very special night. Everyone is still hyper and happy as they have been all night and its very infectious. The Australian chefs look glad to be a part of this and a little in awe of the Iron Chefs and the Japanese chefs that they've brought over look like they're having a great time. We're introduced too to Chen's son, also a Chef no doubt to carry on the Chen Food Dynasty. John lets us know that they've set up a table for signings and photos and they also pass out gift bags. As we're closest to the table outside we make haste for the door and are the first to get autographs and photos. 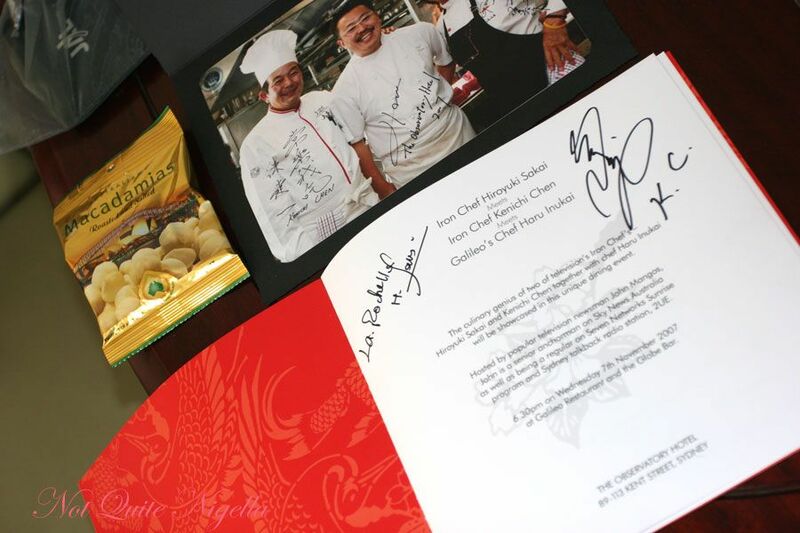 We're also given a gift bag which houses a signed photo of all three chefs, a sample of Australian Macadamias, a JAL luggage tag and assorted sponsor pamphlets. They say that money can't buy happiness but looking around at the enormous queue for autographs and photos I'm not convinced. Each of these moneyed up or Iron Chef loving individuals looks absolutely satisfied, well fed and excited by the end of the night. A night that dreams are made of indeed thanks entirely to the lovely people at Australian Macadamias! featureA Masterclass with Tetsuya Wakuda & Win A Place at a Masterclass!